The most recent episode is on ‘Open Research‘, so Chris and Dan joined podcast host and library colleague Fiona to talk about the work the Research Support team does to support OU research staff and students. 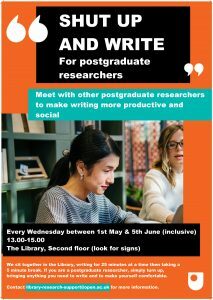 We talked about the variety of research carried out at the OU, how our repositories ORO and ORDO help to spread the word about it, and about the training we provide. Follow the link to listen to Completely Shelfless episode 3. ‘Open Research’, or find it on your favourite podcast app. If you have a specific source type in mind, all you need to do is use the search feature and choose from the results. If you’d prefer to explore Cite them right, you can browse using the categories in the menu bar. Each category expands to show you different types of sources you can reference. The ‘Basics’ section is a good place to start if you are looking for general advice about referencing. Once you’ve found the source type you’re interested in, you can use a dropdown menu to view that source using different referencing styles. The You Try feature enables you to easily construct your own reference by replacing the example text with information relevant to your information source. You can either copy/paste your reference into your assignment or email it to yourself for later. Cite them right works on your tablet or smartphones, so you’ll always have the guidance you need at hand. 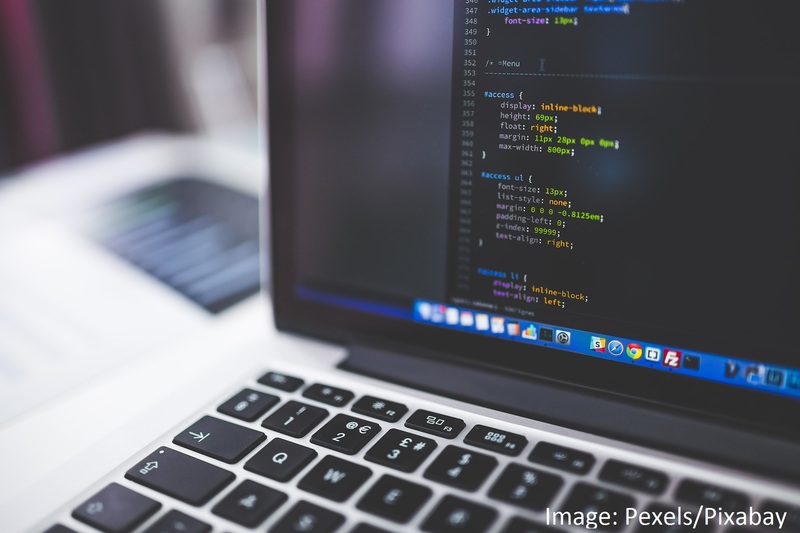 It covers a wide variety of source types from books and journals to computer games, live performances, government and legal publications. It also covers a variety of citation styles, such as APA, MLA, Chicago and Harvard (author-date). 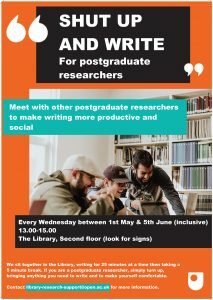 A couple of weeks ago we held an informal event for researchers to share their experiences and knowledge of working with research data. 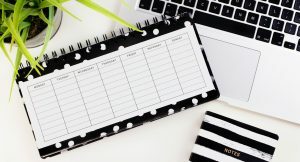 The idea was to hear from researchers about how they work and what’s important to them, away from the (valuable but not always so exciting) talk about complying with funder policies and writing data management plans. 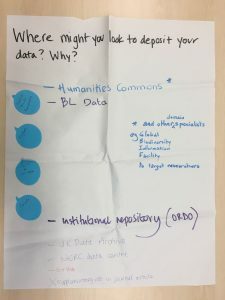 We hoped this would start some conversations and potentially help build a community around research data management at the OU. If that sounds familiar it could be because it’s something Lancaster University have been doing very successfully for a while. The suggestion to plan a similar event at the OU came from talking with our friends at Figshare (the repository our research data repository, ORDO, uses), in particular Megan, who also gave us lots of help before and during the event. So, with thanks, we pinched Lancaster’s idea and even the name ‘Data Conversation’. 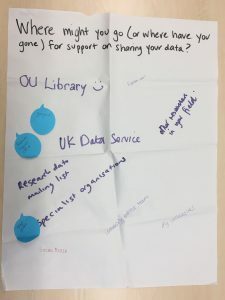 We had a theme of ‘open data’ and invited OU researchers to come along to talk on that topic for about 15 minutes – and were delighted to have a brilliant line-up of talks. David King – a Visiting Fellow in Computing & Communications, David talked about the history of his work with biodiversity and agriculture data, and the many systems he has used to manage and share information. We heard how technologies and tools like DOIs, institutional repositories (hello ORO and ORDO! ), and collaborative document management like Office365 can help to work with and share research data. David also touched upon his joint research in the Humanities with Francesca Benatti on the A Question of Style project. You can see David and Francesca’s slides here. Sarah Middle – Sarah’s a PhD student studying Digital Humanities/Classical Studies, and talked about her PhD in using linked data in Ancient World research. 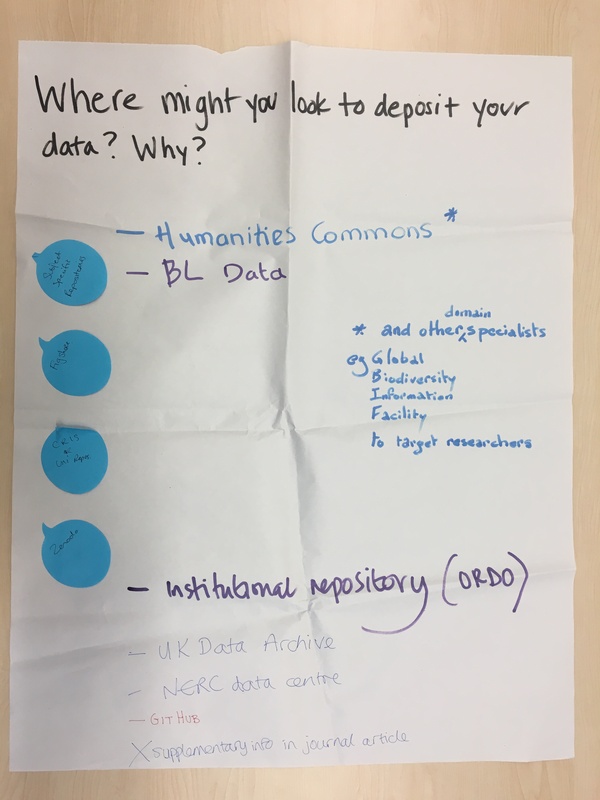 Through examples of Sarah’s work linking UK Arts and Humanities project data, and working with the British Library on Privy Council appeals data, we saw how openly available data can be re-used. However, re-using that data can require a lot of work to make it usable in a new format, and to be sure if, and how, it can be shared further. Sarah also took us through the process she has gone through to ensure the data she collects from surveys and interviews can be as open as possible, by working with the OU’s ethics committee and library research support. Nancy Pontika – Nancy is Open Access Aggregation Officer at CORE, (the Open Access repository based in the OU’s Knowledge Media Institute), and told us about the work CORE does to provide research publications to anyone, anywhere, by harvesting content from open access repositories. CORE has over 135 million metadata records and 11 million full text items and makes its API and dataset open for others to use freely. We also heard about the development of the upcoming analytics dashboard, for institutions to assess the impact of their research outputs. You can see Nancy’s slides here. Tony Hirst – A Senior Lecturer in Telematics, Tony gave us a whirlwind tour of the many ways he has used open data to answer topical questions, or really to investigate anything that he finds of interest (including the companies connected to Iron Maiden). It was a great demonstration of how an inquisitive and playful approach can produce novel information by combining freely available datasets. You can find many examples of Tony’s work in these links, and generally on his blog OUseful.Info. Tony had delivered an earlier session for the library team here at the OU, about how virtual machines and Jupyter notebooks can be used in teaching and research data sharing, which really piqued our interest too. 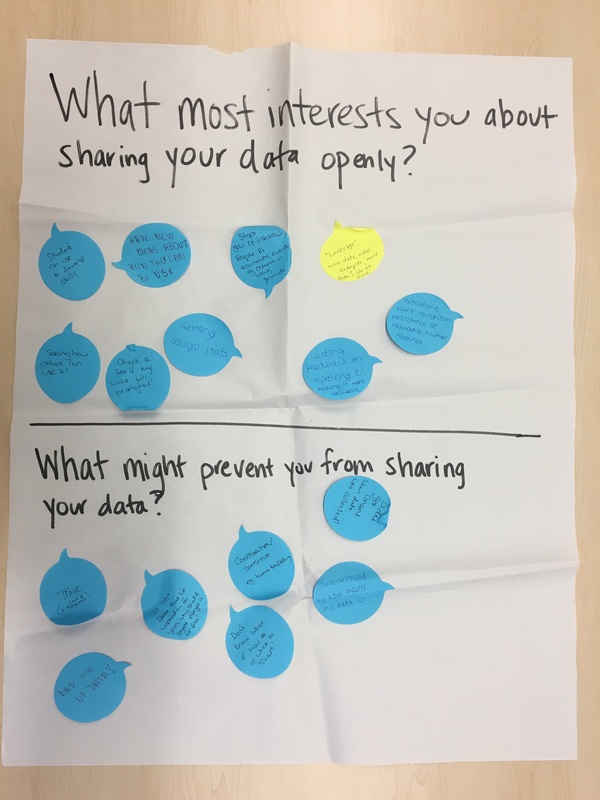 What most interests you about sharing your data openly? What might prevent you from sharing your data? 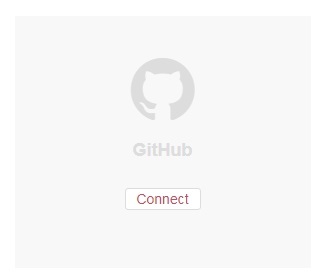 Where might you go (or have you gone) for support on sharing your data? Where might you look to deposit your data, and why? Making data ‘open’ can be a tricky thing to do. Echoing what we often find when working with researchers – that working out where to put it, how to organise and describe it, and whether it is indeed ok to share it (e.g. for personal or otherwise sensitive data) takes time and effort. Then actually doing it takes time too. There are lots of resources and people to go to for support and advice. This is great and shows a commitment from funders, institutions and, most importantly, researchers to work openly. Is there a risk that that it can be hard to pick your way through to the relevant information you need? Possibly. Is it intrinsic or something extra? For some, data sharing is part of their work (See our speakers for example). For others it is seen as an extra task to do at the end of a project or when publishing. There doesn’t have to be one ‘right way’. In the talks we heard positive examples of data being shared and used in a variety of ways. 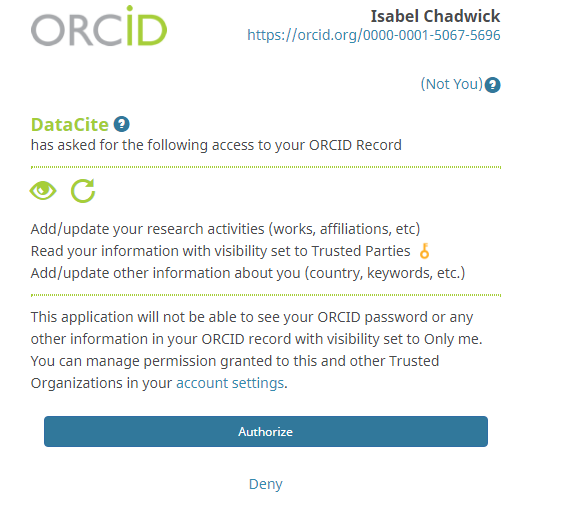 Things like ORCID, DOIs and metadata standards can help identify and link data consistently, but beyond that we don’t all have to use the same methods and systems. It is well worth doing. We were to an extent preaching to the choir, but the mood in the room was that it is certainly well worth doing. Our speakers illustrated a variety of uses and approaches where open data enables and supports research, and the comments we noted for ‘What most interests you about sharing your data openly?’ highlighted benefits for data authors, data re-users, research participants and for generally improving research. So what can we, as a library, do? We can continue to provide the tools and systems to store, preserve and share research data. 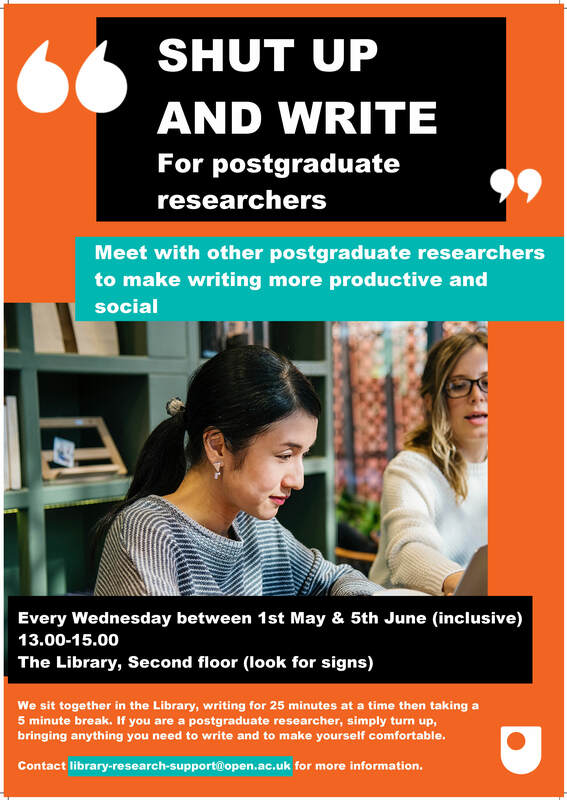 We can support researchers in using them – and when they do, we can help promote and connect the data and other outputs they share. We can continue to provide advocacy, training and advice on data sharing to make researchers aware and prepared to share when planning their work. 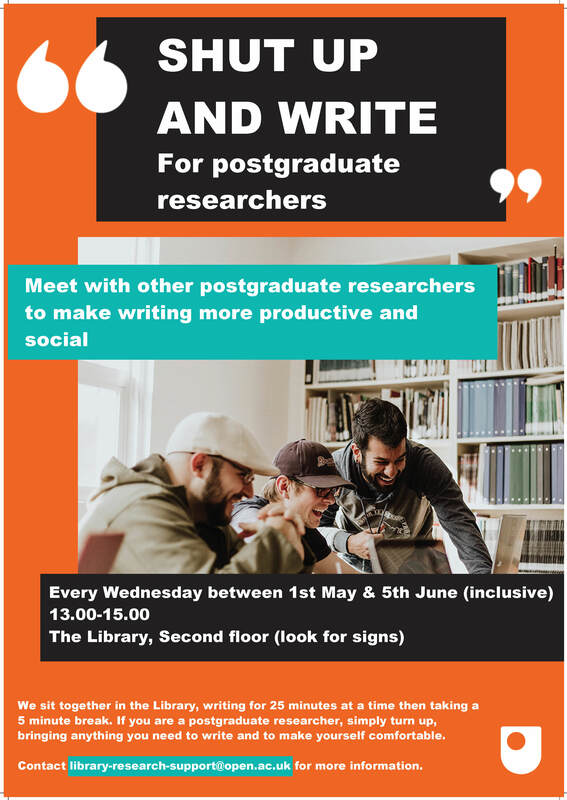 We can also continue to listen and have conversations with researchers about what they are doing, their priorities, and what would help them to do it. And thanks again to everyone who came along! There is nothing particularly unique about the OU spend – it’s relatively small & STEM focused. It appears to share most of the characteristics identified in sector wide reports such as the Jisc Article processing charges and subscriptions report in 2016. Nevertheless, I wanted to make the data available and provide some comments on both the UKRI spend and Gold Open Access publishing at the OU more generally. I hope it can support discussions at the OU about Open Access publishing in the context of continuing funder mandates and the ferment surrounding the announcement, and planned implementation, of Plan S.
After the first year, which appears to be a bit of an outlier with setting up processes, communicating the grant and gradual take up of the grant, we have been paying around 40 APCs a year. Before we go any further, let’s put that into context by looking at the total number of research outputs published by OU affiliated staff. According to Web of Science data, between the years 2013 and 2017, OU affiliated staff published between 1,000 and 1,400 papers a year. (2) So we are talking about a small percentage of OU authored papers here – probably less than 5% in any year. 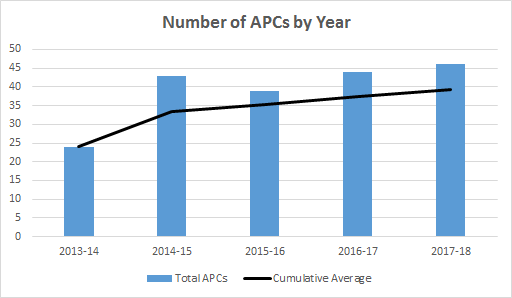 After the first year, the annual cost of the UKRI APC payments falls between £80,000 -£90,000. This year (2018-19) UKRI awarded the OU £68,740.95 – so, this year, we may not have enough to cover all requests. The average cost of an APC across the 5 years is £1,859. 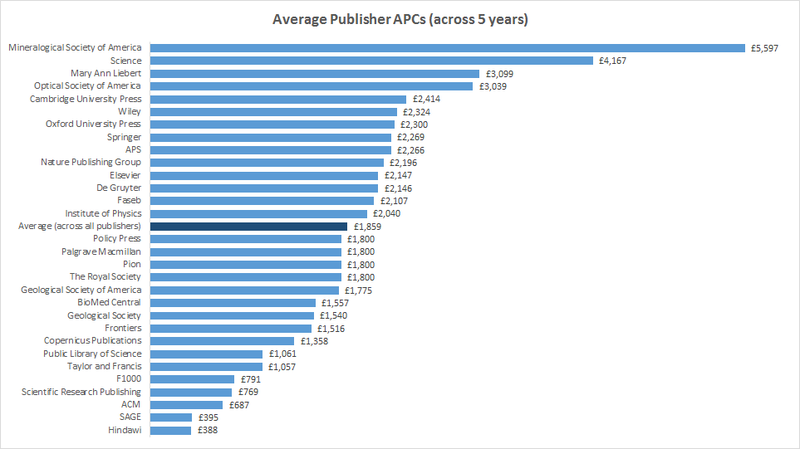 APCs tend to cluster around the £2,000 mark with a few outliers in excess of £3,000, these tend to be APCs from small US based Society publishers. In comparison, the Jisc Article processing charges and subscriptions report calculated an average APC of £1,745 in 2014-15, so we are in the same ball park. 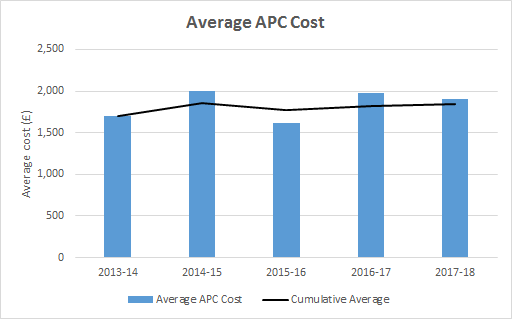 Average costs don’t indicate a massive rise in the average APCs here at the OU – the average in 2013-14 was £1,700 and in 2017-18 it was £1,839 – that’s a rise of 8% over 5 years. Not as significant as the 6% over 2 years identified by the Jisc report, but ours is a small dataset and the averages are easily skewed by a couple of expensive or more moderate payments. So who is getting what? Our figures are dominated by Elsevier and Wiley: Elsevier are getting £141,699 (39%) and Wiley £72,046 (20%) – no other publisher gets more than 5% of the total expenditure. Some publishers are offering discounts (offsetting deals) alongside existing subscription deals – Taylor and Francis and SAGE are the noticeable examples in this data – those discounts mean both of these publishers are not as significant in the APC expenditure data. Elsevier has no offsetting deal in place. What is paid to Elsevier in APCs is in addition to the full subscription costs. Nature and PLOS (direct competitors of Elsevier) report that the failure of Elsevier to incorporate offsetting deals has, in part, led to German and Swedish university consortia refusing to accept new publishing agreements. Wiley has an offsetting deal which is linked to the management of a pre-pay account. At point of writing, due to the low level of APC payments the OU Library makes, we have no pre-pay account with any publisher. 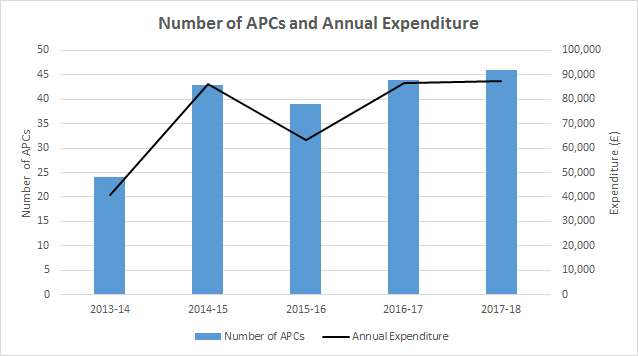 If we had a pre-pay account with Wiley the APC expenditure would not have been so high. Springer currently has a model where APCs are incorporated into a total cost of readership – APCs for OU corresponding authors should be £0. The expenditure referred to above was paid before this model was introduced. 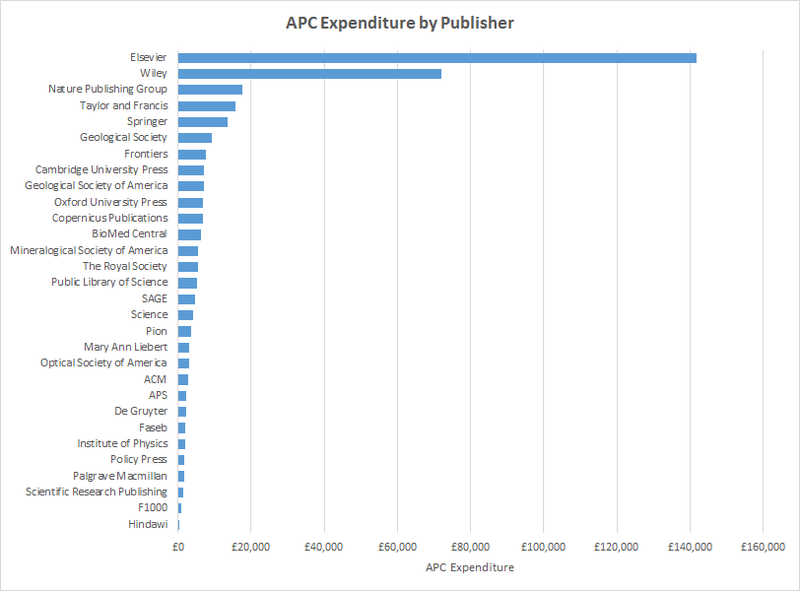 The average cost of an APC varies wildly, but you can see which publishers are the more expensive against an average spend. Not only does the UKRI block grant account for a small fraction of total research outputs being published by OU affiliated staff. It also accounts for a small fraction of the total research outputs being published Gold Open Access. Of the 1,516 journal articles published in 2017 added to Open Research Online (ORO) 363 have been flagged as Gold Open Access. (4) So, if only around 40 of those were funded by the UKRI block grant, what about all the others? Some of these papers will be funded by other institutions’ UKRI block grant. If the lead author is not based at the OU then we wouldn’t normally expect to fund the paper. Additionally, lead authors at other HEIs may have access to central internal funds. Gold Open Access papers are being funded locally – by departments, schools or faculties – at the OU. We know this anecdotally but what is scary is we don’t know the total cost of this across the University. The OU already pays publishers large subscription fees to read the scholarly literature. We are now paying them again to publish our own research Open Access. We shouldn’t continue to pay publishers the same subscription fees when we’ve already paid for some of that scholarly literature to be Open Access. This is the concept known as double dipping. As a university, if we don’t know how much in total we are paying on APCs then we can’t use it to drive fair prices to access the scholarly literature. 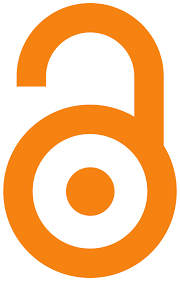 So, it seems to me, the funding of Gold Open Access is disparate; it’s both local and central; planned and ad-hoc; pragmatic and idealistic. By which I mean it has different motivations: from simply publishing OA so you meet funder requirements to publishing OA with the wider aspiration to do Open Research. I suspect those different motivations have created the disparate picture of Open Access publishing we see across the OU. This data does not include any non-APC payments e.g. colour page charges or submission fees. This data does include VAT and foreign currency charges as it has been next to impossible to remove them from all relevant payments. This data also excludes payment from the UKRI block grant made to support the Open Access publication of the conference proceedings of the Listening Experience Conference 2017. (2) 2013 – 1,073 outputs, 2014 – 1,115 outputs, 2015 – 1,250 outputs, 2016 – 1,312 outputs & 2017 – 1,220 outputs. These are only those research outputs indexed by WoS – the actual number will be significantly more. (5) These journals will (in part at least) be funded by institutional resources. In the New Year we will be introducing a new, enhanced Inter-library Loan and Document Delivery system. The major benefit of the new system is that it is fully integrated with Library Search and will allow you to submit requests when you check the library catalogue. The system will pre-populate your Request Form which will reduce the amount of information you need to enter. Additionally, ‘My Library Account’ will display all your OU Inter-library and Document Delivery requests (current and archive) in one place. We will be sending out further information in December, including detailed FAQs and a help video which will take you step-by-step through the process of making a request on the new system. We will also be posting regular updates on the Inter-library Loan and Document Delivery page of the Library website.